Cohen and Mohrman define a team as”a group of individuals who work together to produce products or deliver services for which they are mutually accountable”. The shared goals of the team are made manifest by mutual and cordial interaction by team members, and the roles of each professional in the team are mutually interdependent and accountable to enable achievement of set goals. Similarly, Eduardo Salas defines a team as a “distinguishable set of two or more people who interact dynamically, interdependently, and adaptively toward a common and valued goal, objective or mission, who have been each assigned specific roles or functions to perform, and who have a limited life-span of membership.”  Basically a team consists of a group of people with complementary skills who are committed to a common purpose, performance goals, and approach, for which they hold themselves mutually accountable. The composition of the team at each phase within the spinal cord injury service must be appropriate to the types of service being provided and the needs of the individual with a spinal cord injury. The individual with a spinal cord injury should be central to all decision making and be an integral member of the team that is providing the care. The rehabilitation process should also incorporate an educational element that empowers individuals and their family / carers to take an active role in their present and future management. The ultimate functional desires and expectations of the individual need to be included in the decision-making process. Assist with recovery and rehabilitation. Improve and maintain nutritional status. Improve and maintain immune system function. Maintain weight within healthy weight range. Assist with bladder and bowel management. Education: Information and practical teaching of nursing procedures or related routines to be learned before going home, which also includes teaching carers or family members to be proficient in tasks that you require assistance with. "There is no greater support than that of your peers"
Individuals with a spinal cord injury are a key member of the team throughout each phase of treatment. They are key in the development of goals and should have the opportunity to question the process and / or the goals, and direct their rehabilitation. The family members / caregivers play an essential role and provide emotional support to the individual with a spinal crod injury throughout all phases of treatment. Family and Caregiver education is an important and integral part of any rehabilitation program. ↑ Mohman SA, Cohen SG, Mohrman AM. Sr. Designing Team-Based Organizations. San Francisco: Jossey-Bass.1995. ↑ 2.0 2.1 Salas E et al. Toward an understanding of team performance and training. In: Sweeney RW, Salas E, eds. Teams: their training and performance. Norwood, NJ, Ablex, 1992. ↑ 4.0 4.1 4.2 4.3 4.4 Dijkers MP, Faotto RM. Team Size in Spinal Cord Injury Inpatient Rehabilitation and Patient Participation in Therapy Sessions: The SCIRehab Project. The Journal of Spinal Cord Medicine. 2012 Nov 1;35(6):624-34. ↑ 5.0 5.1 5.2 5.3 5.4 5.5 Ferguson, M. Multidisciplinary vs. Interdisciplinary Teamwork: Becoming a More Effective Practitioner. 2014 Available from: http://www.socialworkhelper.com/2014/01/14/multidisciplinary-vs-interdisciplinary-teamwork-becoming-effective-practitioner/ (Accessed 2 October 2018). ↑ 6.00 6.01 6.02 6.03 6.04 6.05 6.06 6.07 6.08 6.09 6.10 King JC, Nelson TR, Blankenship KJ, Turturro TC, Beck AJ. Rehabilitation Team Function and Prescriptions, Referrals, and Order Writing. Rehabilitation Medicine: Principles and Practice (ed by Delisa JA). 4th Ed, Lippincott Williams & Wilkins, Philadelphia. 2005:1051-72. ↑ Norrefalk JR. How do we Define Multidisciplinary Rehabilitation?. Journal of Rehabilitation Medicine. 2003 Mar 1;35(2):100-1. ↑ 8.0 8.1 8.2 Kirshblum, S. The Academy of SCI Professionals: Multidisciplinary or Interdisciplinary?Journal of Spinal Cord Medicine. 2013 Jan; 36(1): 3. ↑ 12.0 12.1 Interprofessional Teamwork in Medical Rehabilitation: A Comparison of Multidisciplinary and Interdisciplinary Team Approach. Clin Rehabil 2010;24:745-55. ↑ 13.0 13.1 Neumann V, Gutenbrunner C, Fialka-Moser V, et al. Interdisciplinary Team Working in Physical and Rehabilitation Medicine. J Rehabil Med 2010;42:4-8. ↑ 14.0 14.1 14.2 14.3 Momsen A, Rassmussen J, Nielse C, Iversen M, Lund H. Multidisciplinary team care in rehabilitation: an overview of reviews. Journal of Rehabilitation Medicine. 2012;44(11):901-12. ↑ Stack E, Stokes M, editors. Physical Management for Neurological Conditions. Elsevier Churchill Livingstone; 2012. ↑ Harvey L. Management of Spinal Cord Injuries: A Guide for Physiotherapists. Elsevier Health Sciences; 2008 Jan 10. ↑ Brougham R, David DS, Adornato V, Gordan W, Dale B, Georgeadis AC, Gassaway J. Speech-language pathology treatment time during inpatient spinal cord injury rehabilitation: the SCIRehab project. The Journal of Spinal Cord Medicine. 2011 Mar 1;34(2):186-95. ↑ Sherman JE, DeVinney DJ & Sperling KB. 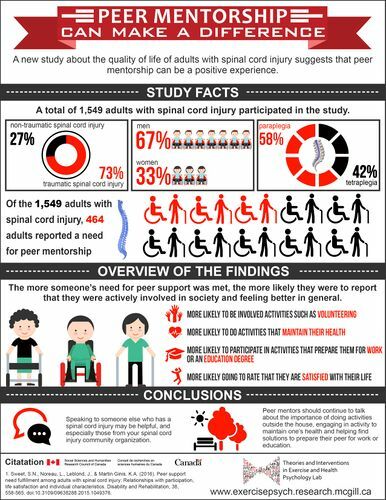 Social Support and Adjustment after Spinal Cord Injury: Influence of Past Peer-Mentoring Experiences and Current Live-in Partner. Rehabilitation Psychology 49, 140 - 149. 2004. ↑ Hayes E & Balcazar F. Peer-Mentoring and Disability: Current Applications and Future Directions. In Focus on Disability: Trends in Research and Application(Kroll T ed.). Nova Science, New York, pp. 89–108. Stanford School of Medicine. Stanford Self-Management Programs. 2008. Available at: http://patienteducation.stanford.edu/programs/ [accessed 12 October 2018]. 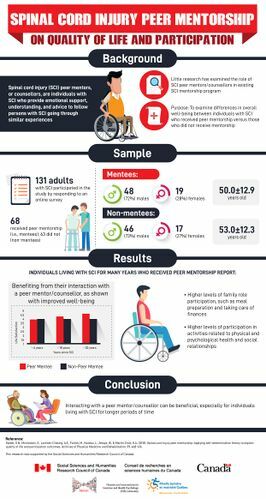 ↑ Ljungberg I, Kroll T, Libin A, Gordon S. Using Peer Mentoring for People with Spinal Cord Injury to Enhance Self‐efficacy Beliefs and Prevent Medical Complications. Journal of Clinical Nursing. 2011 Feb;20(3‐4):351-8.